A combination of political, social, economic and legislative pressures have inspired an emerging culture of learning, competence and performance monitoring in occupational safety and health (OSH) in Kenya, according to one of the country’s up and coming professionals. David Ongesa, 34, grew up in a small village in Homabay County within the western region of Kenya and is from what he describes as a “very humble background.” As a small boy he saw education as his greatest opportunity to break out of this cycle of poverty. He gained a degree in Environmental Science – traditionally seen as a pathway in Kenya to a career in health and safety – and went on to become a Health and Safety Officer. However, David saw a “disconnect” between what he had learned at university and what was required of his role so he decided to achieve the NEBOSH International General Certificate in Occupational Health and Safety. Now, as an Occupational, Safety, Health and Environmental Manager for ARM Cement PLC, David’s approach to monitoring and reducing Lost Time Injuries (LTIs) has captured the attention of not only his peers, but also national government. He has recently taken up the role of ‘National Volunteer OSH Research Ambassador’ as part of Kenyan President Uhuru Kenyatta’s ‘Big Four Agenda’, creating awareness of OSH best practices in the Manufacturing, Health, Housing and Food and Nutrition initiatives. David now addresses workplaces and schools to promote health and safety throughout the country as part of the programme. He has also registered the Integrated SHEQ Ltd Company in Kenya where he is a co-founder and research director and uses the company as a formal platform to deliver OSH mentorship and training programs. David describes the current state of health and safety in Kenya as “vibrantly developing”. He says a key turning point came in 2007 when the government enacted two pieces of important legislation; the Occupational Safety and Health Act (OSHA, 2007) and the Work Injury Benefits Act (WIBA, 2007). According to David, the new laws were in part stimulated by the International Labour Organization’s (ILO) global strategy adopted at the 91st Session of the International Labour Conference in 2003. Economic change, which has seen Kenya develop into one of the fastest growing economies in Sub-Saharan Africa, combined with social pressure, particularly from the country’s trade unions, has also led to greater political will for robust OSH regulation and improved compensation for injured workers and those suffering from occupational illness. The body responsible for reviewing national OSH legislation, policies and actions is the National Council for Occupational Safety and Health (NACOSH), which includes representation from both the Federation of Kenya Employers (FKE) and the Central Organization of Trade Unions (COTU-K). OSHA and WIBA are administered by the Directorate of Occupational Safety and Health Services (DOSHS). While OSHA 2007 is the overarching legislation designed to secure people’s safety, health and welfare, WIBA 2007 provides compensation to employees for work-related injuries and occupational diseases contracted in the course of their employment. David went on to explain that this lack of resource was not only impacting on the regulator, but also on the level of training provision, auditing, plant inspection and health and safety practitioner services. The ILO itself, in its recent assessment of Kenya’s ‘National Profile on Occupational Safety and Health’ highlighted the country’s comprehensive OSH laws and regulations as a major strength, but its lack of learning and training resources and inadequate research and statistics as significant weaknesses. David himself is an example of the positive and emerging health and safety culture that should help to alter the capability and performance monitoring landscape in Kenya. He was recently invited to present his research findings into the reduction of Lost Time Injuries at a Kenyan National Conference on World Safety Day. 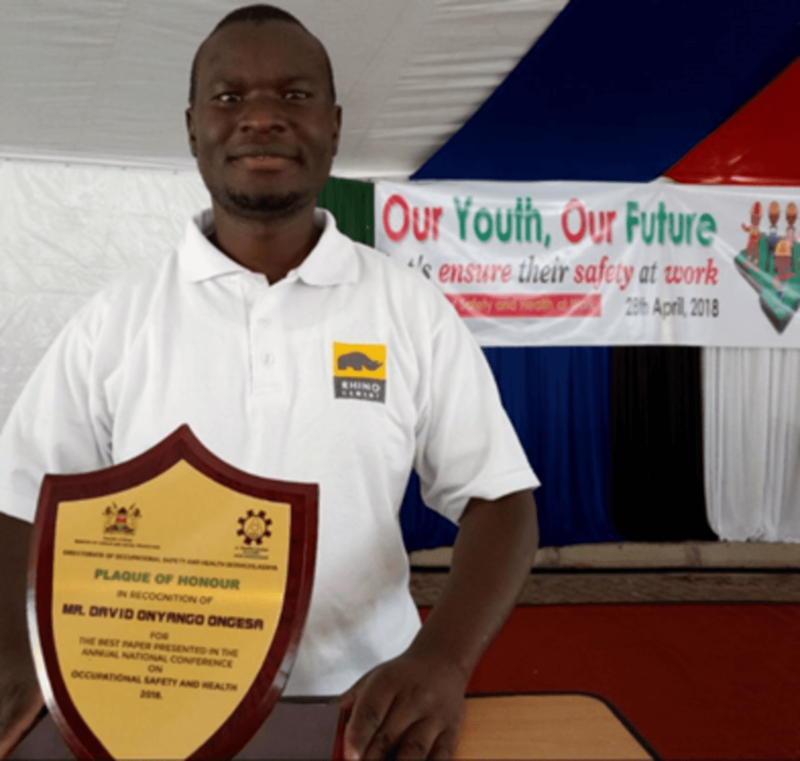 There, he was awarded a plaque by Kenya’s Minister for Labour and the country’s Director of Occupational Safety and Health (OSH) and offered the role of National Volunteer OSH Research Ambassador. David is also supporting the Kenyan government’s drive to encourage young people to participate in postgraduate OSH studies. As well as giving talks in schools and universities, he is mentoring students and encouraging fellow practitioners to follow his lead and gain a NEBOSH International General Certificate, to further extend their competence. 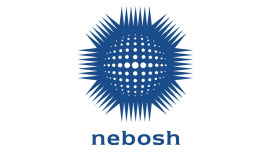 NEBOSH (The National Examination Board in Occupational Safety and Health) was formed in 1979 as an awarding body with charitable status. We offer a comprehensive range of globally-recognised, qualifications designed to meet the health, safety and environmental management needs of all places of work. 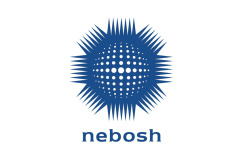 Courses leading to NEBOSH qualifications attract around 50,000 candidates annually and are offered by over 600 course providers, with exams taken in over 120 countries around the world. In 2014, we were delighted to be awarded Britain's highest accolade for trade success, the Queen's Award for Enterprise, for our "outstanding achievement" in International Trade.